I'm dedicating today's post to something so yummy and delicious that it needs no introduction - cupcakes! I'm actually quite a cupcake connoisseur IRL if I do say so myself, and Washington DC has no shortage of such shops if you want to indulge including the oh-so-famous but IMO overhyped Georgetown Cupcake. 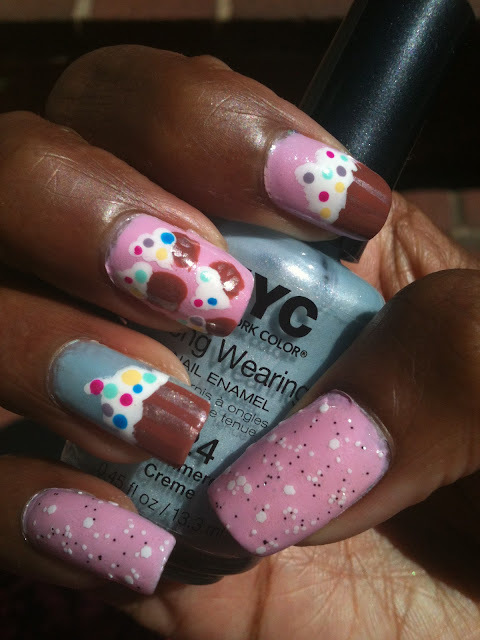 I have my favs - namely Baked and Wired, Hello Cupcake, and Crumbs so when I sat down to do a sweet manicure the first thing that popped into my head was cupcakes. Lots of other ladies have done them, but for some reason I hadn't until now. 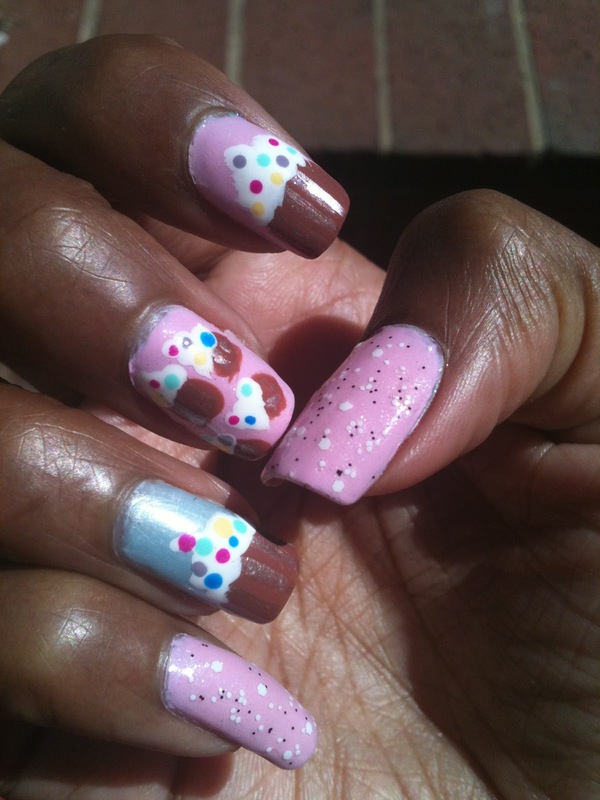 I started with Essie's French Affair and then added a layer of Essie's Peek A Boo. PAB is a very sheer pink polish that really functions more like a super sheer low volume blue shimmer sparkle polish than a stand alone but I love the effect here. I also accented one nail NYC Cashmere Creme - a pale metallic baby blue that is opaque in 2-3 coats. 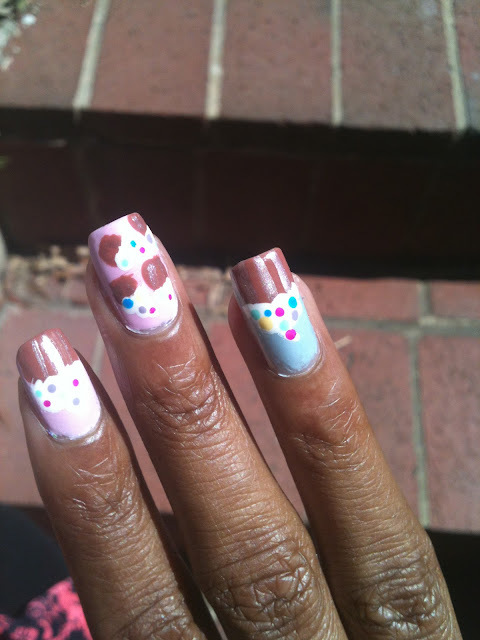 The cupcakes were made from various polishes which I listed below the photos. I wanted to keep the other nails crisp and simple but cute so I added RCL's Mrs. White as a final touch. I ended up loving the way the PAB peeks out from under the chunky white circles of glitter. In the words of one of my favorite drag queens sickening no? (Indoor lighting). 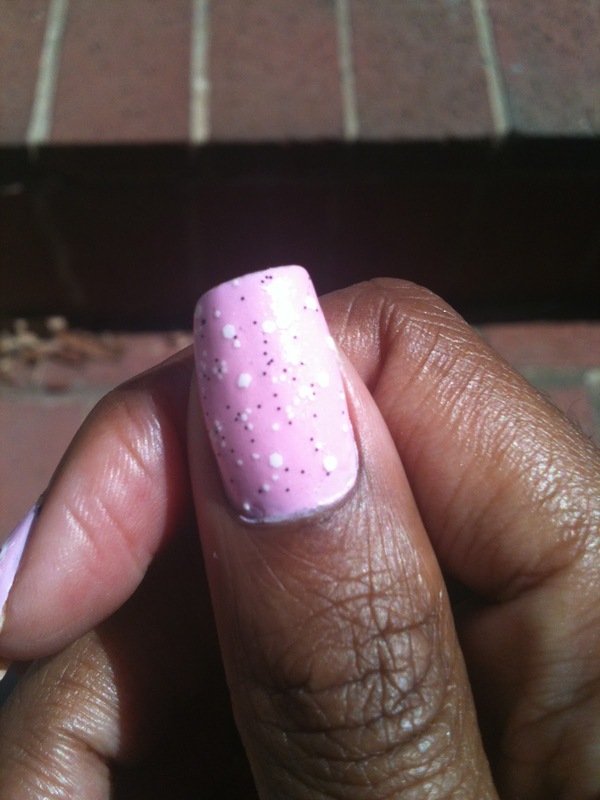 Can you see the PAB glittering gently on the pink of French Affair? 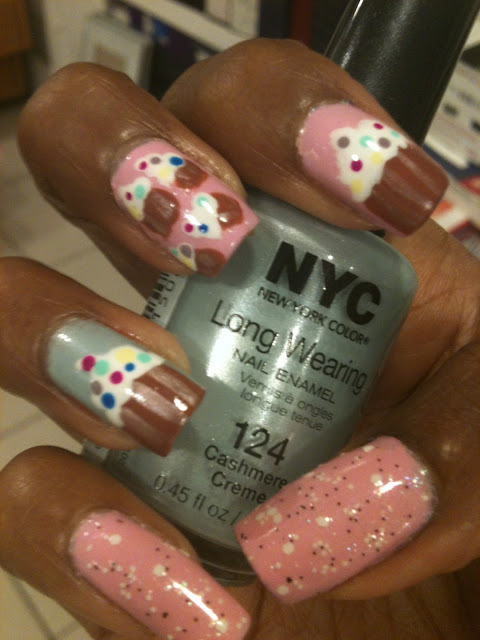 Sprinkles are Color Club Blue Ming and Chelsea Girl, China Glaze Purple Panic & Lemon Fizz and Essies Bangle Jangle. 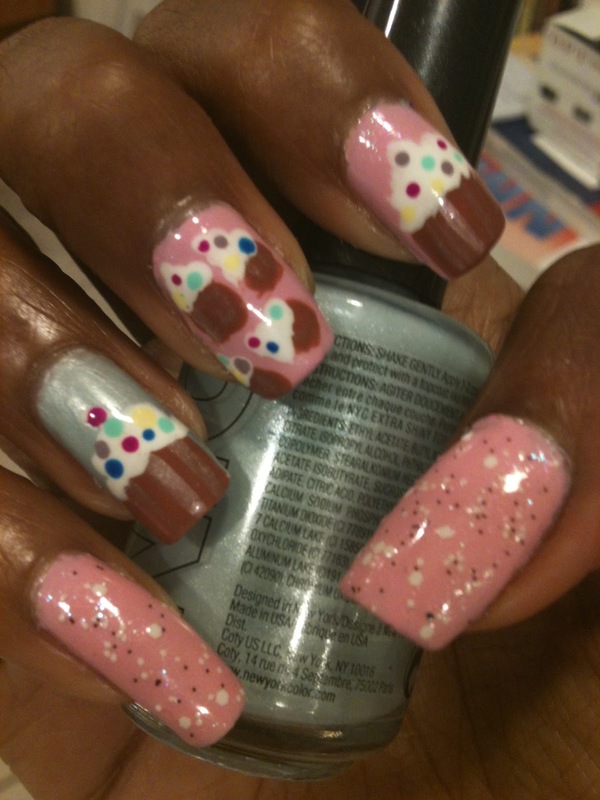 Cupcake base is OPI Chocolate Moose accent by Essie's Buy Me A Cameo. I really love how Mrs. White is it's own sort of sprinkles here as well. My friend L said this mani was like the perfect birthday treat - cute right! I gotta say this is another indie polish winner for me, and maybe it's just me but I think cupcakes got a whole like yummier. Thanks for reading and please let me know what you thought below.